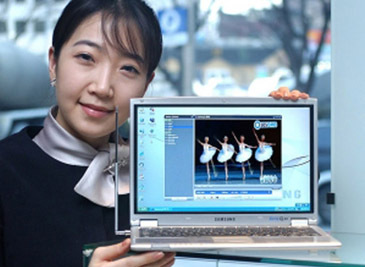 Samsung Electronics has developed new notebook computers capable of receiving land-based digital television broadcast signals while moving. The new model is designed to accept terrestrial digital multimedia broadcasting (T-DMB) services on top of existing functions such as wireless Internet connection. ``With the up-to-date notebooks, customers will be able to savor a variety of killer applications like two-way services based on wireless or wired networks,' a Samsung spokesman said. Users can capture, record and save whatever part they want while watching the digital television broadcasts, it said. The DMB service is compatible with Microsoft's Windows XP, the most common operating system for computers, it added. Samsung is set to mass-produce the new computers as soon as the country launches its terrestrial DMB services, likely this year. South Korean broadcasters are now competing for six licenses for the terrestrial DMB services that will be allocated in March. The data broadcasts of T-DMB will play a pivotal role in facilitating interactive services by allowing people to search for information while watching TV on notebook displays. T-DMB enables folks on the move to enjoy seamless video and theater-quality audio and data through handheld terminals like cell phones and notebooks. Korea looks to launch the world's first T-DMB service this May after issuing six licenses, three for terrestrial broadcasters and the remaining three for others. 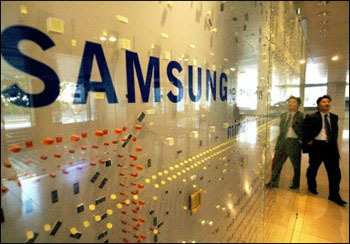 Samsung said it would commence mass-production of the new computers as soon as the T-DMB services start. Early last month, Korea's top mobile operator SK Telecom and its affiliate TU Media also kick-started a pilot run of the world's first satellite DMB (S-DMB) for cell phones. The full-circle commercial debut of S-DMB, the competitor of T-DMB, is also due for May.